People who love movies and people who love conspiracy theories have common ground in The Manchurian Candidate, the 1962 Cold War satiric thriller about an American soldier brainwashed by Communists into becoming an assassin. Since then, whenever a new political figure has emerged from seemingly out of nowhere, a small subsection of paranoiacs has theorized that he or she was a "Manchurian candidate," secretly bent on destroying America. But the movie is significant for other reasons, too, besides its contribution to the English lexicon. Stare intently at the Queen of Hearts and let these behind-the-scenes details wash over you. 1. JOHN F. KENNEDY HELPED IT GET MADE. Frank Sinatra had a deal with United Artists and wanted the studio to make an adaptation of Richard Condon's 1959 novel. But the execs at UA thought the subject matter was too politically controversial and wanted nothing to do with it. Lucky for Sinatra, he had friends in high places, including President John F. Kennedy. Frank visited JFK, who'd been a fan of the novel, and the president made a personal appeal to UA head Arthur Krim, who was especially apt to listen because he was also the Democratic Party's finance chairman. Condon later told a Sinatra biographer, "That's the only way the film ever got made. It took Frank going directly to Jack Kennedy." 2. MOM WAS BARELY OLDER THAN HER SON. Laurence Harvey, who plays the brainwashed Raymond Shaw, was born October 1, 1928 (in Lithuania). Angela Lansbury, who plays his mother, was born less than three years earlier, on October 16, 1925. 3. IT CAME OUT RIGHT IN THE MIDDLE OF A REAL INTERNATIONAL CRISIS. 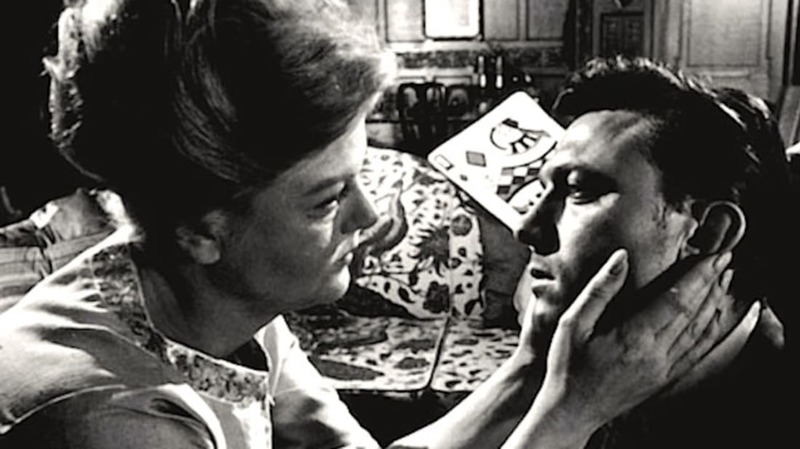 A movie that's dark, political, or satiric is a hard sell under the best of circumstances, so The Manchurian Candidate—which is all three of those things—had an uphill battle at the box office anyway. It didn't help that it was released on October 24, 1962, right in the middle of the Cuban Missile Crisis, during which America and the U.S.S.R. came very close to nuclear war. The film made $2.7 million; at 2016 ticket prices, that would be around $34 million. 4. THE BLURRY SHOTS WEREN'T AN ARTISTIC CHOICE. Near the end of the film, when Marco visits Raymond's hotel room and interrogates him, trying to undo the effects of the brainwashing, some shots of Sinatra are out of focus. Director John Frankenheimer said he got a lot of praise from critics for this "artistic choice"—showing Marco the way the addled Raymond sees him—but, in fact, it was the assistant cameraman's mistake. Frankenheimer was horrified when he saw the footage and called Sinatra back in to reshoot those scenes, but Sinatra couldn't deliver a performance better than that first, blurry one. 5. SINATRA WANTED LUCILLE BALL TO PLAY THE CONNIVING MOTHER. Frankenheimer, who'd worked with Angela Lansbury just a few months earlier on All Fall Down, always wanted her for the part of Mrs. Eleanor Shaw Iselin. But Sinatra had an interesting suggestion, too: Lucille Ball. Putting TV's queen of slapstick in such a malevolent role would have been perversely amusing, but, alas, it was not to be. 6. SINATRA BROKE HIS WRIST MAKING THE FILM—AND THAT'S HOW CLINT EASTWOOD BECAME DIRTY HARRY. It was during the karate fight with Chunjin (Henry Silva). Though the injury wasn't serious, it had lingering effects. Eight years later, Sinatra was preparing to play the title role in the police thriller Dirty Harry—to be directed by William Friedkin—when he discovered the old hand injury prevented him from holding and firing a pistol correctly. Sinatra dropped out; the project stalled; Friedkin made The French Connection instead; and Clint Eastwood (with director Don Siegel) became Dirty Harry. 7. IN THE ORIGINAL VERSION, THE OPENING CREDITS CONFUSED AUDIENCES. When an early cut of the film was previewed, the first scene, in which U.S. soldiers fighting in Korea are captured by the Soviets, played with the opening credits laid over it. But Frankenheimer found that the onscreen titles distracted from the wordless action taking place behind them, and audiences didn't understand what was happening in the scene. He moved the credits to their own sequence and let the important opening moments of the film unspool uncluttered. 8. IF YOU THINK THE MOVIE HAS SOME ICKY CONNOTATIONS, YOU SHOULD READ THE BOOK. Or just take our word for it. There's that unsettling moment near the end when Mrs. Iselin gives her brainwashed son a pep talk and then kisses him, a little too fondly, on the mouth. Frankenheimer said that not only was the incestuous implication intentional, but it was toned down from Richard Condon's novel, in which Mom actually seduces Junior. Needless to say, Frankenheimer never even considered trying to get away with that in the movie. 9. SINATRA'S PRIVATE PLANE HAS A CAMEO. An early scene in the movie has Senator John Yerkes Iselin (James Gregory), his wife, and stepson Raymond Shaw arguing while flying to a campaign event. The interiors for the scene were shot on Sinatra's personal plane. 10. FRANKENHEIMER DID SOME LIVE TV DIRECTING IN THE FILM. The press conference where Senator Iselin announces there are 57 secret Communists in the Defense Department is meant to look like a real news event being covered live by multiple cameras, as shown on the TV in the foreground. To achieve this, Frankenheimer (who had ample experience as a director of live TV) sat in the control truck and called the shots live, the way we see them on the monitor. 11. LAURENCE HARVEY HAD TO JUMP IN THE LAKE ON THE WORST POSSIBLE DAY. According to Frankenheimer, the weather was so cold on the day they filmed Shaw jumping into the lake in Central Park that a crew had to break through a foot of ice beforehand. One of the cameras froze, too. Harvey did the job like a trouper. 12. IT WAS HARD TO FIND FOR A WHILE, BUT NOT BECAUSE OF SINATRA OR JFK. It had lost money for the studio, and the financial deals signed by Sinatra, Frankenheimer, and screenwriter George Axelrod were such that any subsequent profits would enrich the studio, not them. So when the initial deal expired, in 1972, Sinatra's lawyers bought back the rights ... and then Sinatra forgot about it. "I didn't know we owned the rights," he later said. "Whoever was working for me apparently made a pretty good deal." The film resurfaced for its 25th anniversary in 1987, a new deal was struck, and soon it was readily available in all the usual places. 13. THE 1960 DEMOCRATIC NATIONAL CONVENTION SERVED AS INSPIRATION. For guidance in the climactic scene set at a political convention, Frankenheimer and cinematographer Lionel Lindon looked at news footage from the 1960 event at which JFK was formally nominated. Frankenheimer said many of the shots in that sequence are direct copies of real images broadcast in 1960—yet another connection between The Manchurian Candidate and JFK.